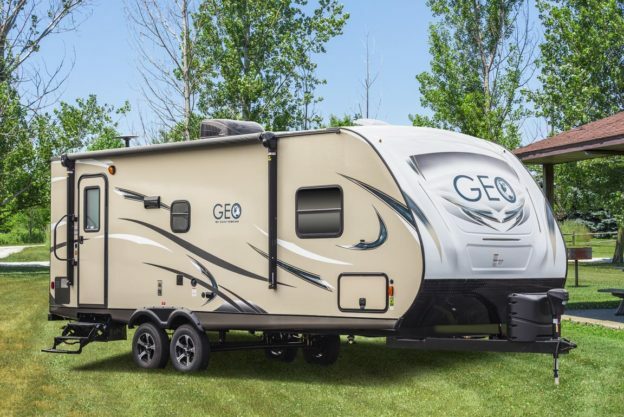 Our new GEO line of lightweight travel trailers started with a simple but profound idea: Combine our thirty-five years of experience building travel trailers with the latest innovations in residential technology and style. 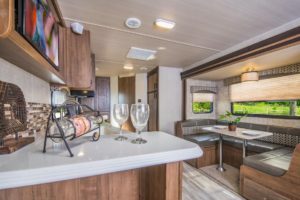 The result is a durable yet nimble line of 20- to 32-ft travel trailers with lightweight laminated walls, luxury features, and state-of-the-art technology. Said another way, GEO brings together everything we’ve learned, and things you’ve never seen in travel trailers before. People say that GEO styling suggests ‘country club,’ not ‘campground,’ and ‘upscale,’ not ‘down-home.’ That’s perfect for the millions of people across the U.S. and Canada, who are adding trailer camping to their list of recreational activities. Free time choices continue to grow, driven by the ease of travel, the destinations we can explore, and the comfort provided by modern technology. GEO gives people the power to take advantage of all of these developments. It bridges the gap between our daily lives and the wild, beautiful world of the great outdoors. Colors are fresh and new. Fabrics and flooring, too. 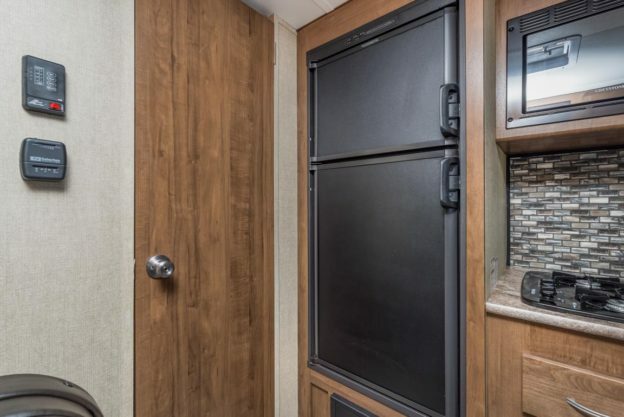 Cabinetry has a modern, sophisticated design, and throughout you’ll find technology that makes camping a pleasure. Like a built-in multi-speaker home theater system that supports AM/FM/CD/DVD, Blue Tooth and SD card input. Like optional solid-surface counters with under-mount sinks and stainless-steel faucets. Like multiple USB charging ports, HDTV connections, and a pencil-tile backsplash in the kitchen. Even soft-pleated shades, and cool, efficient LED lighting. GEO gives you a luxury suite in the midst of the wilderness. If you have an urge to explore and enjoy the natural world, and want to do it all in stylish luxury, make sure you get to know GEO. You’ll love the way GEO can transform any corner of the outdoors into a place of luxury and comfort. This entry was posted in News on August 14, 2017 by pcampbell@gulfstreamcoach.com. Camping in Small Trailers Is FUN! Ask anyone devoted to trailer camping with a small, lightweight, simple travel trailer – Efficient use of space is essential. Truth be told, it’s part of the fun of camping in a smaller trailer too – Coming up with novel, creative storage solutions is more than a passing hobby for many owners, who take advantage of every possible nook and cranny in their much-loved little trailers. One big limitation in the quest for more space, though, is the refrigerator. And unlike the search for more nooks and crannies, there is just so much space inside that cold cube! That’s why Gulf Stream Coach created the 189DD and 199DD. In this case, “DD” stands for “Double Door,” a reference to the Double-Door Refrigerator/Freezers we’ve installed in these two small, rugged, simple, Super-Lite trailers. Big Refrigerators in the Small Trailer World! 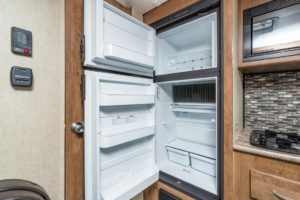 The 189DD and 199DD have the biggest refrigerators ever installed in sub-20-ft travel trailers, giving small-trailer owners more space for groceries, beverages, meals, and treats than they’ve ever seen. Like the appliance you have at home, our big refrigerators actually have TWO compartments – one for refrigerated goods, the other for frozen food. There’s storage space in the doors, crisper drawers, and adjustable shelves, too. Plus, by moving the refrigerator out from under the counter, there’s no need to get on your knees to find the mustard – Everything is easy to see and within easy reach. What about the rest of these two models? Both are built with the solid, reliable, strength and durability that have made Gulf Stream Coach Super-Lite travel trailers famous. Both have handy galley kitchens, full ‘dry’ baths, a handy dinette, a roomy bed, plenty of that much-needed storage, and provisions for a furnace, air conditioning, awning, HDTV, and more. Small Trailers, BIG Refrigerators, Great Idea! If you’re looking for an economical way to get out into the great outdoors; if you’re planning casual camping weekends, or if you’re looking to get out of the tent and into something that’s safer and more secure, make sure to take a close look at the 189DD, the 199DD, and the rest of our Super-Lite travel trailers. This entry was posted in News on August 4, 2017 by pcampbell@gulfstreamcoach.com.